We have had so much fun the past few months experimenting with the different flavors of popcorn. It is so easy to make a different sensation but you think to yourself “ why didn’t I think about this sooner”? 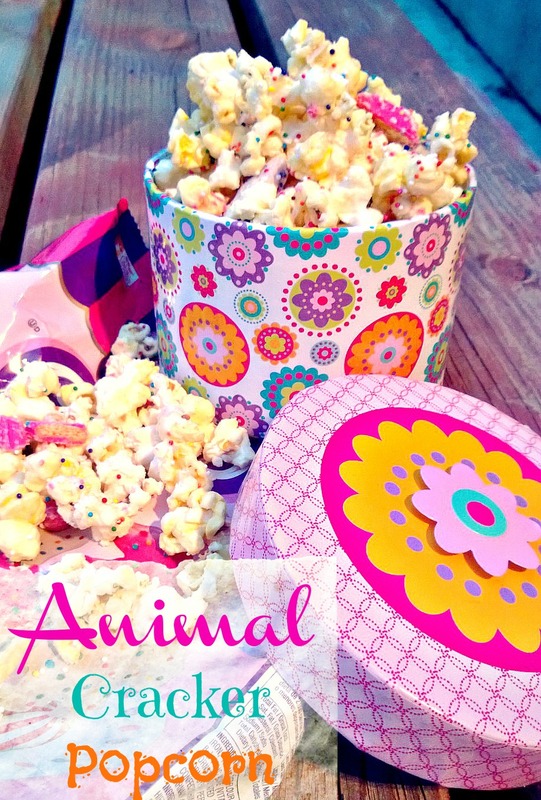 I love animal crackers and so I decided to make this a few months ago, so I would buy a bag of crackers and before I could get to it, my family had eaten them all gone! I even went to to replenish my supply and the store didn’t have any! I finally got to it, with everything going on in May! I made it for my Lisa, to take to her readathon at school. It was a big hit and my husband claims it’s the best one yet! Pop the popcorn according to the directions on the package. We always pour the popcorn in a bowl and shake it, to make the uncooked kernels to fall to the bottom and then slowly transfer it to a different bowl, so hopefully we can get rid of all the kernels. Set aside. Pour the white chocolate chips into a microwaveable bowl. Place the bowl into the microwave and cook in 30 second increments and stirring each time to melt the chocolate. It shouldn’t take more than 1 minute. Pour the melted chocolate over the popcorn and stir gently to coat all of the popcorn in the chocolate. 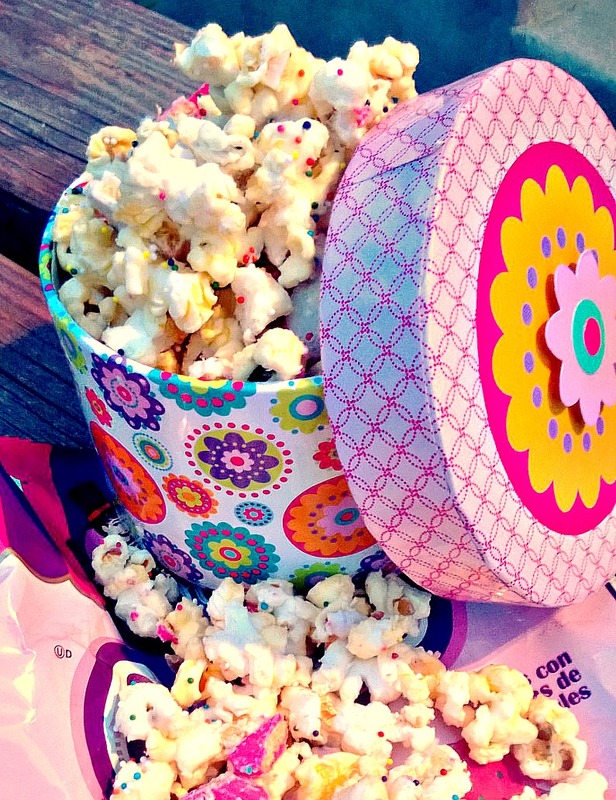 Pour the popcorn out onto a cooking sheet, sprinkle the crushed cookies and sprinkles on top. Let completely cool before serving. This sounds delicious, looks adorable, and I know it will be a big hit with my kids…if I decide to share! What a great idea i cant wait to try it!! This is so cool! I think it would be great for my daughter's birthday in a couple of months! Best part? It seems simple enough to make! Thank you for linking up to the Wake Up Wednesday link party! We hope to see you next week! How cool this looks, it would make a great lil girls party treat!! Thanks so for stopping by to share on The Oh My Heartsie Girls WW this week! Hope you have a great week! Yummy sounds delicious and looks super cute too. What a great idea to put these combinations of flavours together. This is a great idea. And, it's beautiful 🙂 Pinned, tweeted and stumbled! Thanks for linking up and sharing with us at Funtastic Friday. Please join us again this week. Whoa…looks incredible! And I love your gorgeous photos, too! I think I just found my happy place… This looks amazing and your photos have my mouth watering for this! Obviously, this is my feature for tomorrow! Thank you so much for sharing with us at the Thank Goodness It's Thursday party – I can't wait to see all your link ups tomorrow! We are your big sisters , cheerleaders , and confidence boosters in building a happy home. We are the Lou Lou Girls!